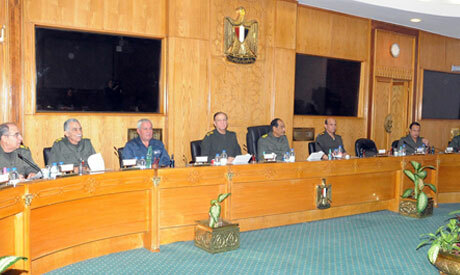 The abruptly announced addendum to the military-authored March 2011 Constitutional Declaration gives the ruling Supreme Council of the Armed Forces (SCAF) unfettered powers and diminishes the role of the coming president, political experts say. Veteran journalist, Ayman Sayyad, while speaking to Al-Hayat TV channel, highlighted that the next president, whether it is former Mubarak premier Ahmed Shafiq or the Muslim Brotherhood’s Mohamed Morsi, will not have any authorities over the military council. "The president will not be able to change the minister of defence or make any changes to the military council; it cannot be touched," he said. Article 53 B of the amended declaration stipulates that – until the new constitution is drafted – the incumbent SCAF members are solely in charge of the armed forces and all their matters, including hiring military leaders and extending their tenures. Moreover, Article 53 B 1 says the president can declare a state of war only upon obtaining the approval of the military council. To the same extent, the president, according to Article 53 B 2, can use the armed forces to contain domestic unrest only through the consent of the SCAF. The revised Constitutional Declaration, which was already ratified upon being published in Egypt’s official gazette, will be publicly announced by the SCAF at a press conference on Monday. The SCAF’s complete independence from the president as Egypt’s military institute is not the only worry. Its political authorities have also been magnified, according to Pakinam El-Sharkawi, a Political Sciences professor at Cairo University. This particular article gives the right to the president, the SCAF chief, prime minister, the Supreme Council of the Judicary or a five members of the Constituent Assembly to call on the constitution-building body to reconsider any articles of the new constitution, whilst it is being drafted. This can only be done, the amended constitutional document states, on the grounds that the constitutional articles in question go against the aims of the January 25 Revolution, or the principles of the previous Egyptian constitutions. The Constituent Assembly, the body tasked with writing the constitution, was elected on Tuesday by the parliament but could well be dismantled after the People’s Assembly (the lower house of Egypt's parliament) was dissolved by the SCAF, pursuant to a court ruling that declared parliamentary elections law unconstitutional. Article 60 B also stipulates that the SCAF will form a new constituent assembly should the current one be defunct. The controversial declaration came after Saad El-Katatni, a Muslim Brotherhood leader and the speaker of the now-defunct People’s Assembly, met with members of the military council and discussed the fate of the constituent assembly. After the document had been issued, El-Katatni said that in accordance with Article 60 of the new Constitutional Declaration, the current Constituent Assembly is still in effect and would convene. He had previously branded the dismantling of the People’s Assembly as "unconstitutional." The dissolving of the parliament’s lower house meant that the SCAF assumed full legislative and executive authorities over the country. On his official Twitter account, opposition figure and former presidential candidate, Mohamed ElBaradei stated: "SCAF retains legislative power, strips president of any authority over army & solidifies it's control.Grave setback 4 democracy & revolution." To read the new addendum to the interim constitutional declaration, please click here. To have Morsi as President without powers over the military for the time being (until a new Constitution is in force) is not the best possible scenario, but it is a reasonable one anyway. In my native Brazil the transition from military dictatorship to democracy took fifteen years (from 1975 to 1990, with setbacks here and there), with further five years to have a civilian Minister of Defence. Transition is a slow-moving process, not without hindrances. Having been in Egypt for the past two years, I can say that Egyptians have achieved quite a lot in such a short period. Maybe it is better for Morsi to have limited powers for now so that some sort of national consensus may be achieved after his inauguration. And if secularists do not achieve good results in the next parliamentary elections (to be held, I believe, within the next six months, about two years after the Revolution) they will have no one else to blame but themselves.